41 years ago tonight (1973) – It took Al Arbour eight games to win his first game behind the Isles bench; it took Denis Potvin as long to score his first two NHL goals, and they both happened in the Isles’ first-ever win over the rival Rangers, a 3-2 victory at a sold-out Coliseum. “The worst part of it all was that Potvin got his first NHL goal, then scores the Islanders’ first power play goal, and it helps them to their first win. And they did it all against a goaltender wearing #1 on his back”, said Ed Giacomin. Even in the early days, the Islander - Ranger rivalry was heated. I believe that this pix is actually from 1972-73. Billy Harris the second star, and “The Entire Islander Team” was named the third star. 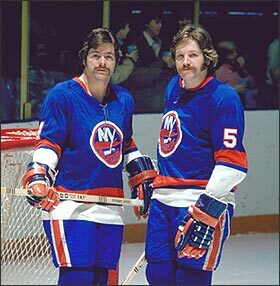 Also on this date: (1979) – Clark Gillies and Mike Bossy scored six seconds apart, setting a club record that stands today, as the Isles beat Chicago 6-4. (1990) – Pat LaFontaine had a hat trick in a 5-2 Isles win over Philadelphia. All-time, the Isles have played twelve October 27th games at the Coliseum and finish with a 6-5-1 record on this date at 1255 Hempstead Turnpike in Uniondale.